Have you ever considered your emotions when it comes to dying. Like do you want to die happy, angry, sad? I mean what’s the point of living a happy life if your last emotion is anger or sadness? If you get angry and have a heart attack. That’s the saddest thing. The last thing you felt was not joy or love but anger. I don’t know why but that came to my mind today when I was just talking to myself and letting my mind wander. This is going to be a short post. I basically want to tell you wonderful readers that I have decided to do a 30-day blogging challenge starting tomorrow. 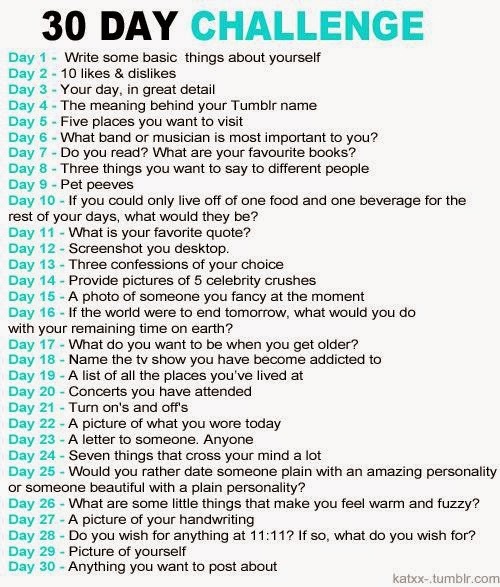 I’m going to challenge myself to blog everyday for the whole month of September. I’m going to forget about writing to please people. Instead I’m going to write for me. I’m going to write to learn more about myself and to show myself that I can be disciplined enough to write every single day. I did a lot of research and came down to two challenges. Since I couldn’t decide between them, I decided to use them both. 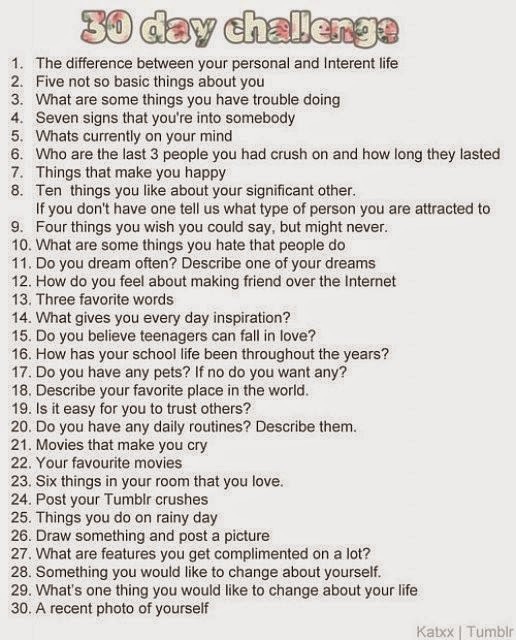 Some topics on some days are not exactly what I would feel comfortable writing about so on those days, I will check the second challenge for an idea. So essentially everyday I will have two ideas to pick from. I’m so excited to get started. I thought I would start doing a monthly favourites post. I’m going to start simple by just doing music favourites. So here we go. 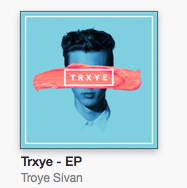 The first thing that I have been loving this month is the TRXYE album. Both theses songs are from Ariana’s new album, ‘My Everything’. ‘Why Try” is super catchy and the beat is really good. I also really like ‘Bang Bang’ from the same album. It was an epic song that featured Nicki Minaj, Jessie J and Ariana Grande of course. I really hope three-person songs start to become a thing because this was really awesome. I am absolutely IN LOVE with this song. It’s so unique and I really like the African vibe it has. The Tiffany Alvord cover of this song is equally fantastic. THIS SONG OH MY GOSH. I used to really like this song when I first heard it on Chicken Little I think. I don’t know. I think of Chicken Little when I listen to this song. Recently I looked it up because it somehow found its way into my head. 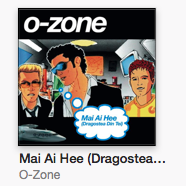 I found it and I haven’t been able to stop listening to it for some reason. 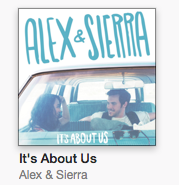 Can I just say that I LOVE Alex and Sierra. They are adorable. I totally ship them and I have shipped them since the X-Factor. I kind of feel like they are really utilising the money they won. Like you rarely hear of the other X-factor winners from previous years. Where the heck is Melanie Amaro? So I really support them as they use this money to further their careers. 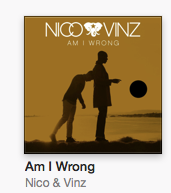 I also think that the music from their new album is AH-MAZING. They are slowly releasing their album song by song so go check it out. My current favourite is ‘Little Do You Know’ but I’m sure there will be more when the full album is out. That’s all for my August favourites. Hope you guys enjoyed it! I just saw the mid-season finale of Pretty Little Liars. 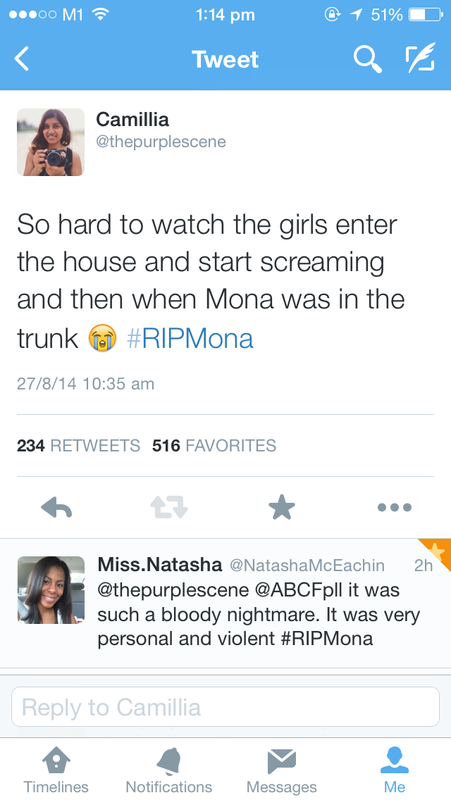 About 5 minutes before I saw the episode, I saw the huge spoiler that Mona had died. I was so upset because I hate spoilers so much. Anyway, now that I’ve got that out, lets go into the episode. The episode opened with Emily, Hanna, Aria and Ezra all standing outside Mona’s house. They were all holding each other and crying and there was police tape everywhere. Viewers didn’t know who had been killed though. It was very sweet to see Emily hugging a sobbing Hanna and Ezra hugging Aria. I really pity Spencer. She’s a good person but she’s being haunted by all these things from the past. She doesn’t even know what exactly she did on the night of Bethany Young’s murder. I think Alison was just cruel to pin the murder of Bethany on her. I mean she knows how much this is affecting Spencer. I loved watching Emily get so excited about decorating her house and being so happy. It was also pretty sad when Emily found out that Alison simply handpicked them. I think as the ‘loyal one’, she was the most affected by this news. I’ve always felt that Emily is the most sensitive in the group. Like she truly is a loyal person. She was the last person to believe that Ali was capable of lying to them. She was the last person to stand by Ali. I think she was really the most betrayed and I hate Ali for doing that to her. I’m so proud of him for having graduated from the police academy (even though it somehow only took about 3-4 episodes). Anyway, I was really happy for him and I was kind of angry at Spencer for not prioritising his graduation ceremony. I know they were in the middle of something revolutionary but they do something like this every day. Toby needed her that night and she was not there. I wonder if the car accident was on purpose. Maybe someone didn’t want Toby to be on the police force. Also, I wonder if his injury will affect or delay him becoming a police officer. I really hope not. Can I just say right now that the Ezria feels were just killing me? I loved the part when they were making the pumpkin pies together and Aria was telling him how her family was like and how they would be judging him. It was really cute and so honest. Like I feel that this show. This whole A thing takes away the lives of all the girls. So to see Ezra and Aria have such a normal conversation in such a normal situation was extremely nice. I just can’t even with these two. They are so adorable together. That scene when Toby showed up at Spencer’s house and they did that policeman acting thing was just too cute. Again I thought that this slab of normalcy was very refreshing and very sweet. Can I just say that I was just starting to like her. You could see that she truly did what she did because Ali scared her and pushed her to the edge. And she really tried to make amendments in this episode by helping the girls. It was so sad that just as she solved the case, she was so brutally murdered. And it must have been a brutal murder. She was in her room upstairs but there was blood all over the house. She was thrown into a trunk! That’s so violent and tragic. Yes she did a lot of nasty stuff. But she didn’t deserve that. Finally, Alison. I think she truly is a psychopath and I truly believe that she is A. I don’t think that she killed Mona though. The girl that killed Mona had shorter hair then Ali. Maybe it was Cece. I despise her honestly. 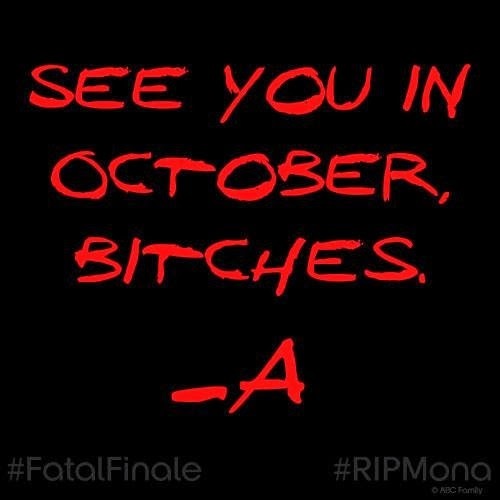 Well, that’s it for PLL reviews till October. Also, I got retweeted by the official PLL Twitter page this morning. And this happened. 234 retweets and 516 favourites. It’s still happening. Like people are still retweeting and favoriting. It’s blowing my mind. I’m pretty starstruck. Recently I discovered a couple of simple things that actually make me happy. I guess they were there always but I only just acknowledged them. I am in love with whipped cream. I know it’s super fattening and unhealthy but I love it. I think a little whipped cream treat once in a while isn’t the worst thing in the world. I love licking the whipped cream with chocolate sauce off the top of my chocolate drinks. I don’t know. It just makes me happy. Maybe it’s the sugar. I am in love with the Chocolate Chip Cream Frapps (with whipped cream of course). I guess it is again the sugar but I do feel great after having one. Recently, I told my dad that Starbucks makes me happy and he took my Starbucks card and topped it up for me. I was so touched. Yes yes. I know. I’m not a brat. I’m just blessed to have loving parents. Anyway, I don’t live that close to a Starbucks so it’s a treat I allow myself only once in a while. Let me clarify. Sometimes, especially on days when I have nothing to do, I like to wake up at like 5.30am or something and just hang out with my family. My dad and brother would be getting ready to leave for work and school and I would just be walking around the house with them as they got ready and I would talk to them. My mom would usually be up too and she will make breakfast for me. I then like to just watch TV. I never watch TV anymore. I watch a lot of TV on my laptop but I rarely sit in front of the TV. So I’ll just watch cartoons or anything that’s on really in my pyjamas and sometimes I fall asleep again. It’s just really nice. My favourite time of the day is when I shut down all my gadgets for the day and I just curl up in bed and wait for sleep to take me. Usually to fall asleep, I’ll tell myself a story. This is highly personal but I usually imagine my perfect life with the people that will hopefully one day be in my life. That is my absolute favourite thing to do. When I’m cosy and warm and just being my perfect future self. I really love the rain. It’s my favourite weather ever. The best is night/early morning rain. I love cold weather so much and I love it when the sky is dark and its so windy that the trees are moving. I love being able to sit in my room with a sweater on. It’s so cosy and nice. Sweater weather is just perfect always. This is becoming too common. This usually happens in the evenings. I start to feel a bit down and so I start to feel like writing. When I’m sad, I like to write. So somehow I’ll find myself at my blog. I’ll read through old posts and then I’ll end up staring at a blank new post page. I’ll wait and try to figure out what exactly is making me sad just so that I can write it down and post something remotely coherent and it just never comes. I’ll write one line, save it to my drafts and leave it. The fact is that I am not coherent. When I am in a mood, I am just not coherent. I can’t pinpoint exactly what is making me sad but I know that there’s this heavy feeling in my chest. I feel like crying. I actually feel like cutting open my chest to take this feeling out. This weird thing that feels so awful. Ugh! I just have this need to convey something. Anything. To someone. God I’m such a messy person when it comes to emotions. I’ve never been popular. I’ve never had many friends. But I’ve mentioned all that in a post before. Tonight I wanted to talk about something different. I want to talk about feeling insignificant and unwanted. I’m the quiet friend. The person who blends into the background. As an introvert, I tend to zone in and out of social interaction. It’s the best way I can really describe it. That being the case, all my life, I’ve struggled with feeling insignificant. I worry that my presence often means nothing. Because I am quieter. Because I’m not a very social person. I feel like people start to see me as part of the background instead of an important, contributing person in a group of friends. When I came to poly, I thought that this feeling that I did not matter would go away. It didn’t. Everyday I struggled with the fact that I was not able to be enough. I was putting in a 100% to suppress my feeling to run and hide. I struggled to put myself out there. But apparently that still wasn’t enough. I was fighting to find my place with my friends. It seemed like everyone else knew where they stood. But I was there just trying to fit in. It was hard work. Sometimes my brain would scream at me to retreat after a conversation but I would fight the urge and I would continue being social simply so that people wouldn’t think me strange. I’m still looking for that one person. That one friend who will finally understand me and what makes me tick. That one person who sees me. Actually sees me and doesn’t put me down as being background noise. I guess I crave being understood and accepted for the first time in my life. I don’t want to be insignificant. I don’t want to not matter. I’m writing this on impulse. I saw something on twitter that made me very upset and I had to let it out. So here it is. My messy emotions have been thrown here. Hopefully I’ll be able to sleep now. So day 2 of decorating my room took a bit of time because my printer ran out of ink and I had no way to change it myself till my dad helped me on Wednesday. So today I basically put up more pictures in my room. 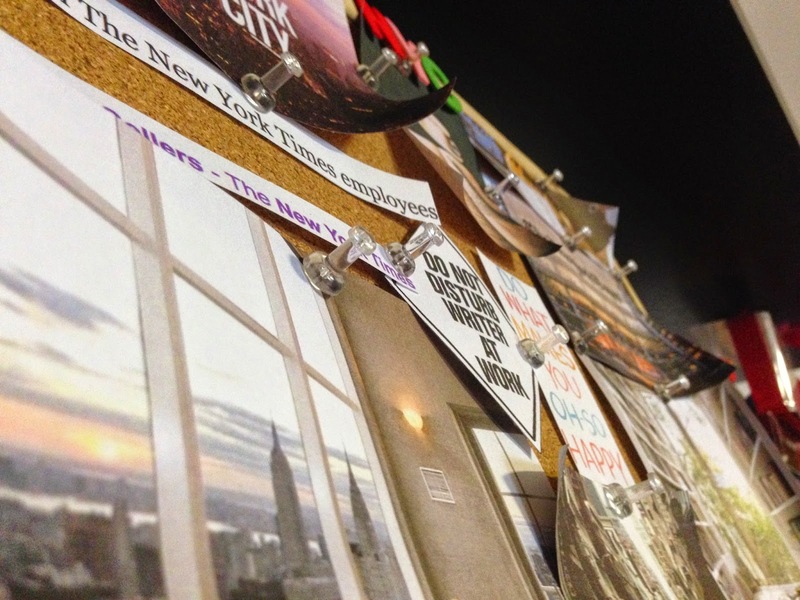 I also started and finished my vision board today. I’m really excited about it but I won’t talk much about it here because I want to dedicate a whole post to my vision board tour. I’ll give you guys a sneak peek here though. Do you ever start to panic? I mean really panic. When you start to feel really cold. When you know deep down in the pit of your stomach that something is not just situationally wrong, but emotionally wrong? When everything suddenly seems to cave in on you. When your heart starts to race and when you feel like you’re in a bubble all alone. When you start to hyperventilate. When all you want to do is to crawl into a tiny tiny space and cry. When you suddenly become hyperaware of every single thing around you and you can’t take the overload on your senses. When you start to shake and you can’t stop it. When nothing seems right. It’s called a panic attack. I personally have experienced this more times then I care to remember. It’s a scary feeling honestly. My latest one was in my school’s library. We had to print out our project that we’ve been working on for 5 months and present it. And everything that could have gone wrong was going wrong. We were late for class along with other groups from our class and I started to panic. No one knew though. In the middle of the printing room, I suddenly lapsed into silence. I moved to stand behind my friends and let the panic take me. You never really know that you’re having a panic attack until you’re in the middle of one or even only after you’ve calmed down. My heart started speeding up and I started shaking. I felt like throwing up. I stood there next to my friends in silence for a while and then I had to walk away from them. I walked away, tried to breathe a bit and then walked back. I did this a few times. I ended up snapping at one of my friends because she told me to stop tapping the table. I was tapping the table to count my breaths and to try to calm down but she didn’t know that so it’s not her fault. I eventually completely walked away from them and I texted my mom asking her to call me because I wasn’t sure if she was teaching or driving. Thankfully she called me back immediately. She spoke to me for a bit just calming me down and telling me to breathe and relax. Mostly it was her voice that calmed me down. After I got off the phone, things started to look up and by the time we got to class and had to present, I was calm enough. The panic attack had passed. I only realised that it was a panic attack while I was on the phone with my mom which was interesting. So finally semester is over and I have a lot of time on my hands. During semester, my room got really messy. I kept making excuses and saying that I was too busy to clean up. I finally decided to do something about that and I cleaned up a lot. 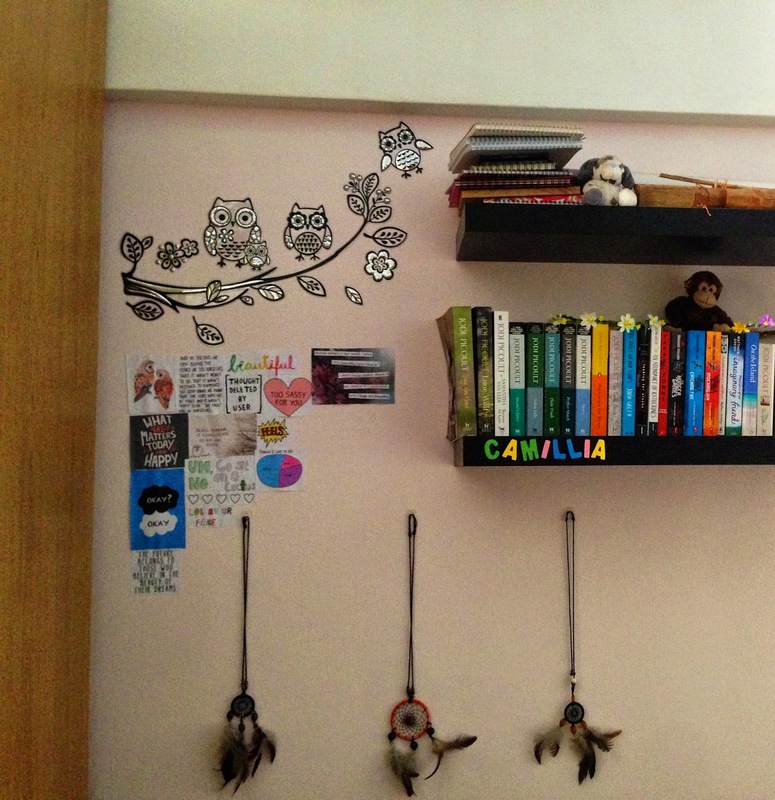 As I was clearing up, I found the owl wall stickers my mom had bought me. She bought them last month for me but I hadn’t had time to put them up. I started trying to figure out where they should go and as I was doing that, I started to notice how much bare wall space I have around my room. I’ve always wanted to do something cool with my room but I’ve always planned too much and ended up not doing anything. Yes. I plan too much. So I decided to just start. 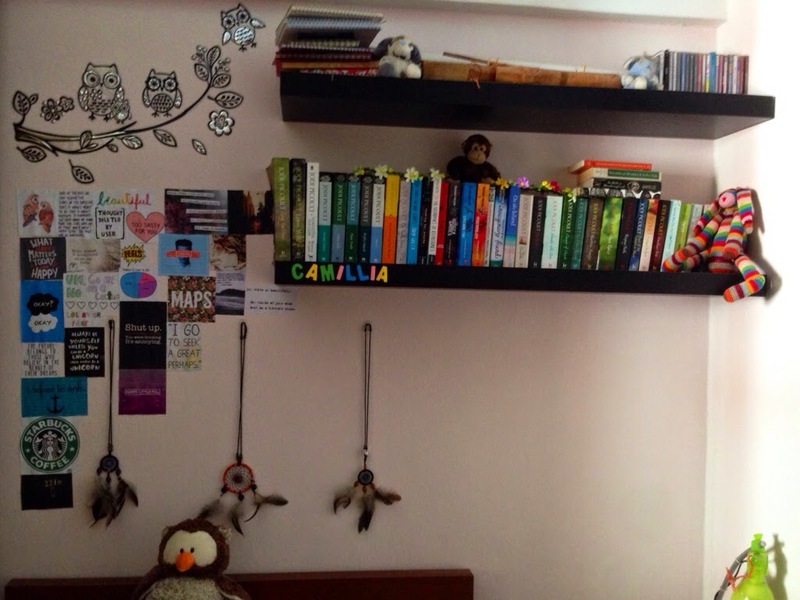 I put up the owl wall stickers and then decided to work on the wall behind my bed. After a bit of time on Tumblr, I had a collection of some pretty pictures that I wanted to put up on the wall. I printed them out and started cutting and pasting them up with double-sided tape. 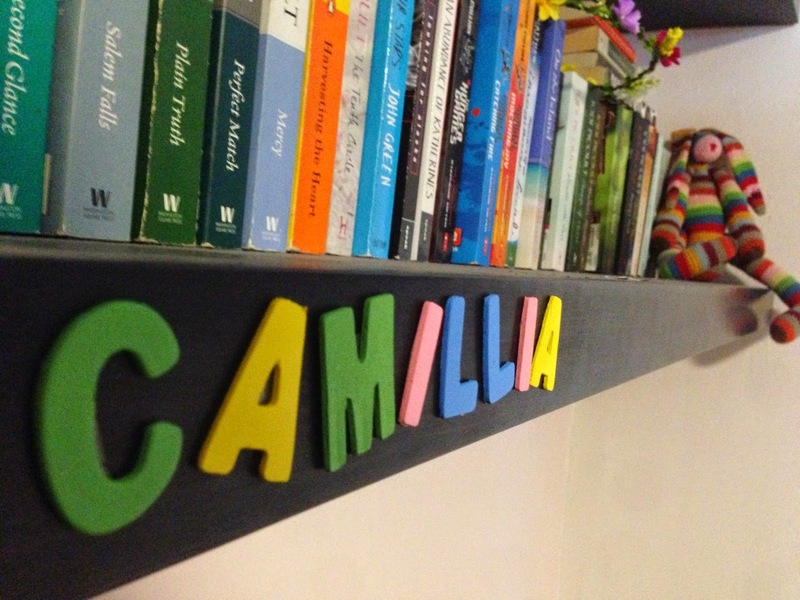 After that, I got some wooden alphabets to put up my name along the edges of my shelf.